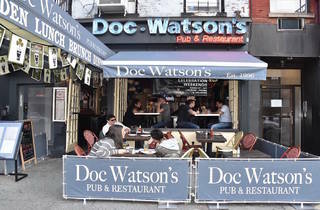 Upper East Siders can continue their search for the perfect pint at Doc Watson’s, the neighborhood’s local Irish pub. Though the bar offers a few signature cocktails and wine options, the beer menu is much more extensive. Like any Irish bar worth its salt, Doc Watson’s has Guinness on draft ($8), and it also carries the slightly harder-to-find Magner’s Cider ($6). The food menu mainly offers standard bar fare, but with an Irish twist—the list of starters includes deep-fried bratwurst wrapped in bacon ($10), cheddar jalapeno pretzel bites ($7) and beer-battered fried mozzarella with marinara ($11). 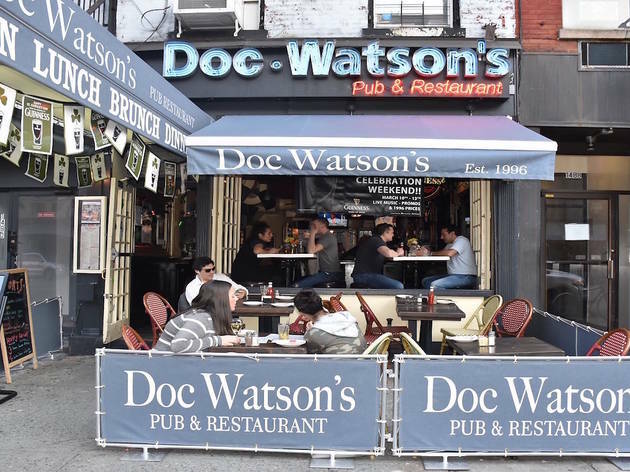 Doc Watson’s offers a variety of different burgers and sandwiches ($13-$17), plus chicken pot pie ($18), buttermilk-fried chicken ($18) and a traditional Irish breakfast—black pudding, sausages, baked beans, eggs, soda bread, the whole deal—served all day ($18). Doc Watson’s is a fun and lively Irish/English pub that serves great food, has live entertainment and even a beer garden. They are open for brunch, lunch and dinner. If you have a hankering for some black pudding, head over there for brunch. The menu also has a homemade veggie burger, fish n chips, shepherd’s pie, and lots of appetizers, salads, burgers, and soups. No Irish/English pub would be successful without a great selection of beer, and they’ve got that taken care of here. You can also get signature cocktails and wine all served to you by the lovely Irish bartenders.